We’d love your help. Let us know what’s wrong with this preview of Suffragette by Emmeline Pankhurst. The closing paragraphs of this book were written in the late summer of 1914, when the armies of every great power in Europe were being mobilised for savage, unsparing, barbarous warfare-against one another, against small and unaggressive nations, against helpless women and children, against civilisation itself. How mild, by comparison with the despatches in the daily newsp The closing paragraphs of this book were written in the late summer of 1914, when the armies of every great power in Europe were being mobilised for savage, unsparing, barbarous warfare-against one another, against small and unaggressive nations, against helpless women and children, against civilisation itself. How mild, by comparison with the despatches in the daily newspapers, will seem this chronicle of women's militant struggle against political and social injustice in one small corner of Europe. Yet let it stand as it was written, with peace-so-called, and civilisation, and orderly government as the background for heroism such as the world has seldom witnessed. The militancy of men, through all the centuries, has drenched the world with blood, and for these deeds of horror and destruction men have been rewarded with monuments, with great songs and epics. The militancy of women has harmed no human life save the lives of those who fought the battle of righteousness. Time alone will reveal what reward will be allotted to the women. This we know, that in the black hour that has just struck in Europe, the men are turning to their women and calling on them to take up the work of keeping civilisation alive. Through all the harvest fields, in orchards and vineyards, women are garnering food for the men who fight, as well as for the children left fatherless by war. In the cities the women are keeping open the shops, they are driving trucks and trams, and are altogether attending to a multitude of business. When the remnants of the armies return, when the commerce of Europe is resumed by men, will they forget the part the women so nobly played? Will they forget in England how women in all ranks of life put aside their own interests and organised, not only to nurse the wounded, care for the destitute, comfort the sick and lonely, but actually to maintain the existence of the nation? Thus far, it must be admitted, there are few indications that the English Government are mindful of the unselfish devotion manifested by the women. Thus far all Government schemes for overcoming unemployment have been directed towards the unemployment of men. The work of women, making garments, etc., has in some cases been taken away. To ask other readers questions about Suffragette, please sign up. I'd be lying if I claimed to be a fan of Madame Pankhurst and her gang, but given the centenary of the Representation of the Peoples Act (1918), and the fact that a steeply discounted copy of her book flaunted itself wantonly before my eyes for a mere fifty pence I willingly undertook to see how self-serving her memoir was. I found it a hugely entertaining and worthwhile read, although towards the end the lengthy accounts of trials for all their rhetorical sparkle was a lit Nothing to celebrate ? I found it a hugely entertaining and worthwhile read, although towards the end the lengthy accounts of trials for all their rhetorical sparkle was a little wearisome. 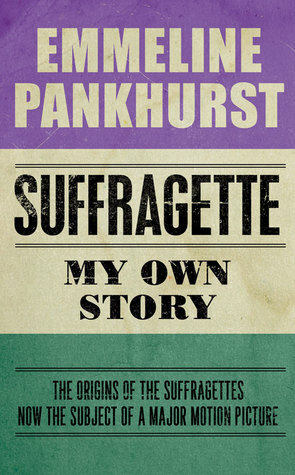 It is a memoir written in 1914, after the outbreak of war in Europe, for an American audience, in order to raise funds for the cause, on the up side this means that Pankhurst explains aspects of the British political system and the history of the movement for women's suffrage which may well be obscure not only to the American of 1914 but also to the contemporary reader (curiously at that period if a MP was appointed a Minister it triggered a by-election allowing constituency voters a veto or to endorse the decision). On the downside it is narrowly political book (for example she does not mention the death of her husband who had been a supporter of women's suffrage and had defended them in court, nor does she mention her withdrawal from the Labour Party in 1907) and designed to serve the ends of the movement which she founded, the Women's Social and Political Union, better known as the Suffragettes as they were dubbed by the Daily Mail which even then delighted in attempting to belittle and demean those who disagreed with it's editorial line. One of the elements of the cause which came through strongly was that of a family quarrel, Pankhurst's parents and husband were supporters of the Liberal party, one of her early memories is of campaigning for the Liberals by raising her green skirt to reveal her red petticoat - green and red were the party colours at the time, one can see in this an early fondness for 'deeds not words', but also a mismatch between action and desired outcome. Anyhow that her personal connections were strongly Liberal makes disappointment a defining note of her memoir - her own party had let her down, and part of what she was doing was showing up the illiberalism of the Liberal Party leadership, of the leadership because part of her narrative tells of how there were repeated cross party majorities among MPs for women's suffrage even to the point of private members bills or amendments to other bills that pass their first and second readings only to be brought down by the government. Asquith at first chancellor of the Exchequer, them Prime Minister until 1916 was a firm opponent of women's suffrage while others, like Lloyd George and Winston Churchill, declare themselves in favour but will not break ranks with Asquith and so earn the particular opprobrium of the suffragettes. At the same time a family quarrel among the Pankhursts is hidden from the reader, while daughter Christabel is mentioned through and credited for her intelligence and ingenuity, daughter Sylvia is mentioned once and that in a footnote. In 1914 Christabel performed a strategic flip and moved from a policy of war against the British government to complete support, Sylvia called her a Tory (view spoiler)[ about as strong an insult as can be uttered if your politics are left of centre (hide spoiler)], and the quarrel was never resolved. Sylvia politically felt that Socialism would lead to equality and so drifted deeper in to the Labour party, (view spoiler)[both sisters wrote their own memoirs (hide spoiler)] while Christabel and Emmeline believed that equality would lead to Socialism, Adela Pankhurst doesn't get a look in ( see here, they were an interesting bunch, just a little too interesting maybe for Mama Pankhurst to comfortably cope with. The Labour Party was another disappointment, Pankhurst in her pre-WPSU years had been backed by the Labour grouping for election as a Poor Law supervisor and to her local school board, she was also a Fabian but although Kier Hardy and George Lansbury are praised, the Labour MPs by 1914 along with the Home Rule Irish MPs, were propping up a weak Liberal administration and not leveraging their position to win suffrage for women (Redmond, the Home Rule group leader was apparently opposed to giving the vote to women). Pankhurst was "convinced of the futility of trusting to political parties" (p.16). I was hoping to learn more of the thinking behind Suffragette strategy, but it turns out this is the wrong book for that - although Mother Pankhurst founded the WPSU and appeared frequently as its public matriarchal face, daughter Christabel seems to have replaced her pretty early on as strategic director, perhaps as early as page 45 depending on your edition! Pankhurst frames her movement for women's suffrage as a war, the Salvation Army is an organisational model, Pankhurst desires absolute obedience from her supporters so that when first Suffragettes throw stones through Downing street windows the women apologise to Mrs Pankhurst for acting without orders. She repeatedly stresses that men's votes were won through violence, believing that rioting or the threat of rioting won earlier extensions to the franchise. I am not convinced that she was correct in her analysis, in the British case arguments over the franchise were extremely stressful but within political parties. Troops were deployed to menace and overawe the Chartists just as police were deployed against striking coal miners in this period and later after WWI, soldiers fired on striking South Wales coal miners (Winston Churchill was involved in that too (view spoiler)[ the man had his thumbs in more pies than should have been physically feasible (hide spoiler)]) I didn't read anything here to shake me from my view that the issue of women's suffrage was as Max Planck is paraphrased as saying one in which change occurred due to one funeral at a time (view spoiler)[Eine neue wissenschaftliche Wahrheit pflegt sich nicht in der Weise durchzusetzen, daß ihre Gegner überzeugt werden und sich als belehrt erklären, sondern vielmehr dadurch, daß ihre Gegner allmählich aussterben und daß die heranwachsende Generation von vornherein mit der Wahrheit vertraut gemacht ist. (hide spoiler)] with the ousting of Asquith as Prime Minister (but not Party Leader) and the eventual Liberal Party split it was possible to legislate for votes for some women off the back of extending the franchise to all men over 21 in 1918, I suspect purely as a result of generational change. Women's suffrage had been repeatedly before Parliament since the days of John Stuart Mill - who Pankhurst mentions in her brief account of Suffrage movements before her time although she forgets the role of Mills' not-wife Harriet Taylor. What they did achieve was to capture the imagination. Reading Pankhurst, she gives the impression that Women's suffrage was dead in the water until she came along and revived it, other suffrage groups she admits existed, but they are portrayed as stirred into action by her, riding on her coat tails, and responding to her initiatives (even when they act before her group). Somehow I doubt that Millicent Fawcett would tell the same story, but it is a political memoir and that's to be expected. Having said that it would be stupid to think that events progress in a certain direction forever delivering greater freedoms and getting closer to equality and fraternity, the highly visible tactics of the WPSU no doubt helped keep the issue in the forefront of minds even if they did not directly win the vote. The WPSU true to Pankhurst's framing pursued their political objectives in a warlike manner - even when arrested and imprisoned, rather than this representing control by state power - no it is simply a new battlefield, the women refuse to wear prison uniform or to obey prison rules and talk to each other while exercising, they hunger strike. In a foreshadowing of WWI it becomes a war of attrition. The essence of the story seems to me to be about authority, the WPSU challenged both the liberal aspirations of a reforming Liberal administration and the authority of the government as an institution. 1909 saw the defeat of the 'Peoples budget' in the House of Lords which led to the Parliament Act (1911) giving the commons legal superiority over the House of Lords, the same Liberal administration which advanced itself as the champion of the people against the inherited and established privileged classes was being shown up as simply another form of entrenched power seeking to conserve its own authority and privilege. Although having said that the movement looks to have been largely upper middle and upper class in character with supporters even in the House of Lords, so it is another family quarrel so to speak, within the ranks of the privileged, even if it did have a certain anarchic potential. Thank god we have people like Emmeline Pankhurst that existed in the world! What an inspiring and true pioneer of her generation so dedicated to the suffrage cause and paving the way for future generations of women. Incredible story of perseverance, of ardent passion and how a group of committed women incited others to gather together with a single minded purpose. This is an important history lesson that should be compulsory learning, how valuable to teach our young girls the lessons of this cou Thank god we have people like Emmeline Pankhurst that existed in the world! What an inspiring and true pioneer of her generation so dedicated to the suffrage cause and paving the way for future generations of women. Incredible story of perseverance, of ardent passion and how a group of committed women incited others to gather together with a single minded purpose. This is an important history lesson that should be compulsory learning, how valuable to teach our young girls the lessons of this courageous group of women that sacrificed so much for the sole purpose of gaining the fundamental franchise of equal voting rights. It's a frustrating read and I was enraged at the obstacles encountered along the way by archaic mysogynist members of parliament who were intent to block all progression of the women's suffrage cause and I can now better understand the extreme measures of militancy these women undertook to get their message across. It was necessary! Emmeline Pankhurst, principale rappresentante del movimento delle suffragette, si batté contro l’ostilità del governo che non voleva riconoscere il diritto di voto alle donne. La protesta, iniziata in modo pacifico interrompendo i discorsi dei rappresentati politici con una domanda ripetuta all’infinito: «Il governo liberale darà il voto alle donne?», non ottenendo che qualche vaga promessa destinata a perdersi nel nulla sfociò in atti di rappresaglia. Emmeline e le donne del movimento subirono Emmeline Pankhurst, principale rappresentante del movimento delle suffragette, si batté contro l’ostilità del governo che non voleva riconoscere il diritto di voto alle donne. Emmeline e le donne del movimento subirono maltrattamenti, arresti, processi e condanne severe. “ Hanno deciso che per gli uomini è vigliacco e disonorevole restare silenziosamente inerti dinanzi a regole tiranniche che impongono su di loro vincoli di schiavitù, ma che per le donne la stessa cosa non sarebbe vigliacca e disonorevole, solo dignitosa. Bene, le suffragette ripudiano nel modo più assoluto questa doppia scala di valori morali. Se è giusto per gli uomini lottare per la propria libertà – e Dio sa come sarebbe oggi la razza umana se non lo avessero fatto, dall’inizio dei tempi –, allora è giusto anche per le donne lottare per la propria libertà e per la libertà dei figli che portano in grembo. Gli atti di protesta s’interruppero con l’inizio della Prima guerra mondiale, e il governo rilasciò le militanti incarcerate. In quest’opera autobiografica, Emmeline Pankhurst racconta la sua vita di donna, moglie, madre, fondatrice della “Women’s Social and Political Union”, attivista e simbolo della lotta per i diritti delle donne. Un libro per le donne che combattono coraggiosamente ogni giorno contro le disparità. Most people have heard of Emmeline Pankhurst and her campaign for women's suffrage up to 1914. In this book she gives us her view of it and the reasons for the growing militancy in the WSPU she founded. She wanted representation on the same terms as men in national elections, which is only fair. The UK electoral franchise before the Great War was very unfair. Only a minority of wealthier men could vote. The Liberal Party, when in power, introduced three Representation of the People Acts, which in Most people have heard of Emmeline Pankhurst and her campaign for women's suffrage up to 1914. In this book she gives us her view of it and the reasons for the growing militancy in the WSPU she founded. She wanted representation on the same terms as men in national elections, which is only fair. The UK electoral franchise before the Great War was very unfair. Only a minority of wealthier men could vote. The Liberal Party, when in power, introduced three Representation of the People Acts, which increased the number of men eligible to vote and extended the franchise across the social spectrum. They wanted representation for all men, without wealth or householder qualification, which is only fair. The fourth Act gave all adult males (over 21) the right to vote and also extended this right to women over thirty who were registered as resident, married to a resident or a graduate in a university constituency, but it was not passed until 1918. We have David Lloyd George and Millicent Garrett Fawcett to thank for that enormous extension of enfranchisement in the UK. Even after all the deaths in the war and the influenza epidemic, the removal of (most) plural voting and the limitations on women voters, the Act tripled the electorate. In the unfair electoral situation existing before 1918 the WSPU (from 1903), other women's suffrage groups and the Liberal Party were all working for fairness (as were the Labour Parties). Emmeline Pankhurst opposed universal suffrage because she thought it would never happen. (I would like to think she was not ideologically opposed, but the only Parliamentary candidates she was prepared to endorse were all opposed to it.) She wanted a Women's Suffrage Bill put before Parliament. Many Liberal MPs supported women's suffrage, but were opposed to the WSPU's plans for limited enfranchisement as giving more votes to wealthy women at the expense of working class men. Attempts were made before the war to couple together demands for increased male enfranchisement and women's enfranchisement, but they all failed and the two groups ended up opposing each other. Neither got their bills through Parliament. As a believer in democracy, I find disenfranchisement on grounds of wealth or social status iniquitous. As a believer in women's rights, I would have been as frustrated as the women who joined the WSPU at their lack of parliamentary representation. I would not have wanted to choose between them. At the time of the 1918 'Coupon' Election my grandparents were a serving soldier, a pupil-teacher living with her parents in a farm cottage, a very junior merchant seaman and a nursemaid, later nanny. The 1918 Act gave the first three the right to vote in principle, although only the soldier was old enough to do so. The nanny lived in her employer's houses and had to wait until the Representation of the People (Equal Franchise) Act in 1928. If an Asquith Universal Male Suffrage Bill without any provision for women had become law, my grandfathers would have gained the right to vote when they were 21 in 1917 and 1924, my grandmothers would not. If Mrs Pankhurst's supporters had introduced a Women's Suffrage Bill on the same basis as male suffrage and it had become law, my grandfathers might have gained the right to vote when they became householders in 1946 and 1929 (I say might because neither of them ever owned their homes), my grandmothers would not. My sailor grandfather was not at sea during the 1930s until he joined the RAF (Air Sea Rescue) during the Second World War, but if he had been my grandmother could have been registered as the householder instead of him and voted in local elections. Under Mrs Pankhurst's bill (but not Mr Asquith's) she could also have voted in national ones, so the last grandparent to be enfranchised under the legislation as actually passed would have been the first. What did Mrs Pankhurst and the valiant women of the WSPU achieve? Some historians have sidelined her and even said she delayed women's suffrage, many women feel she got them the vote. She estimated that her proposals would have enfranchised about 500,000 women; Mrs Fawcett's compromise proposal in the 1918 Act enfranchised over 8 million women, along with an addition 6 million men. The 1928 Act, introduced by a Labour government and enacted by a Conservative one, had almost universal support. There is no escaping the fact that working with the Government enfranchised approximately sixteen to seventeen times as many women as burning down their houses (even if the suffragette campaign had succeeded). Mrs Pankhurst and the WSPU campaign certainly weakened the Liberal government and probably delayed universal male suffrage. They did, however, keep the cause of women's suffrage in the newspapers, which was one of her aims. Some newspapers reported favourably, some unfavourably and some reported gleefully on anything which harmed the Liberal government, but they kept reporting. Lloyd George was in favour of women's suffrage and introduced it as quickly as he possibly could. Keir Hardie, the leader of the emergent Labour Party, was also in favour. WSPU militants attacked both of them, which was either a very poor choice of targets or due to their support for the working-classes of both sexes. Force-feeding and the Cat and Mouse release and re-arrest measures were discredited after WWI. They were not used on later hunger strikers in prison demanding political status and several were allowed to die. I hesitate to call this a positive achievement, but it did have publicity value. The writing itself was somewhat detached - almost more of a daily log than a real autobiography. But that did not detract from the bravery and dedication of the suffragettes and their allies, nor from the frustrating sexism and misogyny they dealt with daily. I also loved this book because it makes you think about where to draw the line when fighting for one's rights. Is there even a line? Where does protest become revolution? Or insurrection? Luckily, a lot has changed in just 100 years - enoug The writing itself was somewhat detached - almost more of a daily log than a real autobiography. But that did not detract from the bravery and dedication of the suffragettes and their allies, nor from the frustrating sexism and misogyny they dealt with daily. I also loved this book because it makes you think about where to draw the line when fighting for one's rights. Is there even a line? Where does protest become revolution? Or insurrection? Luckily, a lot has changed in just 100 years - enough that reading about the political reality of women at that time seems almost unbelievable. But there are some incredible parallels to our modern times that cannot be ignored. Specifically, Mrs. Pankhurst's often repeated statement that to truly fight for change, you have to hit them where it hurts - namely, property. That targeting mailboxes and golf courses can do far more than all the peaceful marches and banner-hoisting in the world. It immediately made me think of the recent and ongoing unrest in so many places over police brutality and violence against black communities - the media portrays the unrest as "riots", but are they not also following the militant suffragettes' example? That in order to truly gain the rights and equality denied to you, you must make your statement against property? It's the same question the suffragettes asked - why is safety of property considered more important than equal rights for an entire segment of society? Emmeline's own account up to 1914, before she threw herself into the war effort, but before 1918 when women's suffrage was finally granted. Written in a report style and full of political details I skimmed over, but an amazing story of a long, bitter struggle against a stubborn male dominated political system holding tightly onto their patriarchal control of women's rights. Her many years working with the poor: women, children and the workhouses made clear the hopeless prospects for women. They Emmeline's own account up to 1914, before she threw herself into the war effort, but before 1918 when women's suffrage was finally granted. The most powerful aspect of My Own Story - part autobiography, part history, part justification of militancy - is that it was written before the battle for women's votes was won. The effect is that the reader comes close to feeling like an real-time participant in the escalating battle between the W.S.P.U. and the government. Pankhurst doesn't necessarily come off as likeable or at times even reasonable, but there is no doubting her courage and the courage of countless other women. Although I re The most powerful aspect of My Own Story - part autobiography, part history, part justification of militancy - is that it was written before the battle for women's votes was won. The effect is that the reader comes close to feeling like an real-time participant in the escalating battle between the W.S.P.U. and the government. Pankhurst doesn't necessarily come off as likeable or at times even reasonable, but there is no doubting her courage and the courage of countless other women. Although I remain unconvinced by Pankhurst's tactics, this book succeeded in making me understand why so many women believed them necessary. Well worth reading. The way the establishment fought against women's voting rights is scary and it wasn't that long ago. They also unsurprisingly manipulated the press and reneged on promises. Films like Suffragette only show the half of it. That said this is Emmeline's versions of events, worth reading are the books by Jill Liddington: Rebel Girls, and One Hand Tied Behind Us which give a much broader view. Noteworthy omissions in Mrs P's book include her estranged daughter Adela who was shipped Well worth reading. The way the establishment fought against women's voting rights is scary and it wasn't that long ago. They also unsurprisingly manipulated the press and reneged on promises. Films like Suffragette only show the half of it. Knowing Emmeline Pankhurst by reputation only, and having watching and thoroughly enjoyed Suffragette which tells the story through the eyes of one those less famous women who worked and fought with Emmeline, I wasn't sure how I would feel about this. Luckily, Mrs Pankhurst lived up to her reputation, holding back nothing to tell the story not just of her but of the men and women she met, was inspired by and held back by. Emmeline is as clear and concise in her writing as she was in her speeches Knowing Emmeline Pankhurst by reputation only, and having watching and thoroughly enjoyed Suffragette which tells the story through the eyes of one those less famous women who worked and fought with Emmeline, I wasn't sure how I would feel about this. Luckily, Mrs Pankhurst lived up to her reputation, holding back nothing to tell the story not just of her but of the men and women she met, was inspired by and held back by. Emmeline is as clear and concise in her writing as she was in her speeches and her passion for women's suffrage and for our rights in general comes through on every page, as well it should given the way the system, Government and men in general treated her and her peers. Written in 1914, before the vote was granted to women in the UK, Emmeline writes with a quiet optimism that things are starting to move in the right direction and with a pride for her part in its progress. This optimism may be correct but I'm sure she'll be frustrated by how slow other changes are in coming, and the backwards steps that are evident across the Women's Rights movement and of how many of us are no longer proud to call ourselves feminists. Small side note: her pride in her title of Suffragette, and the many others given to her by friends and enemies alike, is particularly important, especially at the moment as so many of us see being a feminist as a bad thing and try to apologise for it or cover it up by describing ourselves as something else. We need to look again at this and take Emmeline's approach, taking pride in the title of feminist, embracing it and loving it. This makes it stronger and shows that women's rights are not debatable, optional or contraversial. Instead it shows them to be an expected part of life, as important as the rights of men, religions, races and creeds. As I was going to see Suffragette - in cinemas now, go see it! - I decided upon reading this memoir first. Though I am not afraid of calling myself a feminist, the militant suffragette movement has always troubled me in terms of morality, right and wrong, whether it was truly necessary. If there is anything this book has managed to convince me of, it is that it was, indeed, necessary. Pankhurst narrates the story from the very beginning, when ideas of suffrage were slowly materialising in a polit As I was going to see Suffragette - in cinemas now, go see it! - I decided upon reading this memoir first. Though I am not afraid of calling myself a feminist, the militant suffragette movement has always troubled me in terms of morality, right and wrong, whether it was truly necessary. If there is anything this book has managed to convince me of, it is that it was, indeed, necessary. Pankhurst narrates the story from the very beginning, when ideas of suffrage were slowly materialising in a political environment, and the suffrage movement was peaceful and tried to reach their goal through official paths, by supporting and working for political parties and attempting to get a suffrage bill read in parliament. What speaks from these years is a deep sense of frustration, of men considering women's suffrage not a real issue that must be discussed but almost a joke, something that can be treated with glee and ignored at will. It is from this that the militant movement, the WSPU was begun - after twenty years of being ridiculed for their desire for honest political representation, some women realised there were other paths to be taken if women's enfranchisement was ever to become law. That is the story Pankhurst here tells her reader: how women fought for their right to vote, how they were cast down again and again, how they were abused in the country's prisons, how the government refused to treat them as political prisoners while they were at the same time told to fight like men had fought for their enfranchisement. A deep, deep anger speaks from this text at times, a disappointment in the government, a feeling of being cheated over and over again, a sense of intense unfairness. At the time of writing, 1914, the War had just started, leading to a truce, but there is a bitterness speaking from the pages for fighting so long already, and now having to wait even longer for what is woman's due. My Own Story made me understrand why the WSPU used civil disobedience as a tool, how destroying property is indeed linked to political campaigning, and how - if the women, perhaps, did go too far - the treatment they received was cruel and inhumane and could but lead to more extreme forms of militancy. My Own Story is Emmeline Pankhurst’s suffragette experience. Penned from her own endeavors to secure the vote for women, we follow Emmeline through significant moments in history as she pushes the cause further towards a hopeful resolution and recognition. The most poignant element of this book is that it’s a recent history of women. Penned over 100 years ago, there’s plenty that is yet to be achieved for women that Pankhurst and the suffragettes identified in their cause all those years ago. Ho My Own Story is Emmeline Pankhurst’s suffragette experience. Penned from her own endeavors to secure the vote for women, we follow Emmeline through significant moments in history as she pushes the cause further towards a hopeful resolution and recognition. However Emmeline’s own story is not without it’s rose colored glasses. A slight investigation into her character is bound to provide you with information that she’s subtlety left out of her memoirs. There was some infighting with influential suffragettes such as the Pethick-Lawrences, and also the rather harsh treatment of some of her own kin. Pankhurst works tirelessly to portray herself as a benevolent caretaker and overseer of compassion for all, however all is not what it seems with Mrs Pankhurst. Rather than lessen ones opinion, researching these other facets of her personality provides a more well rounded understanding of Emmeline Pankhurst and her actions. The book can be overly technical with the to’s and fro’s of the government of the time and the process of having a bill read in Parliament, so these elements of the book can be fairly dry. However the most significant element of this book that reads loud and clear over the 100 + years since it was written was the bravery of the women and men who fought for equal rights – the militant tactics, hunger strikes and prison sentences paints a grim picture of history indeed. An interesting memoir/informative recap of the Suffragette movement in the UK. This book made me feel a mix of emotions as I finished it on the same day that my country (The Bahamas) voted against four bills that would bring more gender parity to the constitution. I listened to the audiobook which was great and I would definitely recommend it. As for the content, while the Suffragettes' struggle for the vote was more physically violent (against the Suffragettes) than I'd previously been aware (vi An interesting memoir/informative recap of the Suffragette movement in the UK. This book made me feel a mix of emotions as I finished it on the same day that my country (The Bahamas) voted against four bills that would bring more gender parity to the constitution. I listened to the audiobook which was great and I would definitely recommend it. As for the content, while the Suffragettes' struggle for the vote was more physically violent (against the Suffragettes) than I'd previously been aware (violent force feeding for women on hunger strikes in prison, beating women up, etc), I wouldn't say there was a whole lot here that really surprised me or changed my perspective on things or enlightened me to things I didn't have inklings about already, but it provided the exact details and was worth the read. It made me want to know more about Pankhurst's upbringing and her family--particularly her daughters who all seem to have been very political and focussed on justice as their mother. Emmeline Pankhurst, these days, has a reputation for being stern and deeply unforgiving of those who have the temerity to disagree with her - a reputation that's probably deserved given that she cut off all ties with two of her daughters (even packing one off to Australia). But, what this book shows is that she was undeniably a great leader who galvanised women into action. While her militancy tactics may or may not have done more harm than good in getting woman the vote, she certainly was instru Emmeline Pankhurst, these days, has a reputation for being stern and deeply unforgiving of those who have the temerity to disagree with her - a reputation that's probably deserved given that she cut off all ties with two of her daughters (even packing one off to Australia). But, what this book shows is that she was undeniably a great leader who galvanised women into action. While her militancy tactics may or may not have done more harm than good in getting woman the vote, she certainly was instrumental in raising the issue in public consciousness. Until recently, you would not have been able to find this memoir at your local bookstore – you would have had to resort to either a specialised publisher or Project Gutenberg. It still doesn't have a cover art picture on Goodreads, that's how little this book is read these days. However, I have eight magic words for you that kicked it right back into the public eye: “Now The Subject of a Major Motion Picture.” Thank you, Suffragette (2015). Republished under the title Suffragette: My Own Story, Until recently, you would not have been able to find this memoir at your local bookstore – you would have had to resort to either a specialised publisher or Project Gutenberg. It still doesn't have a cover art picture on Goodreads, that's how little this book is read these days. However, I have eight magic words for you that kicked it right back into the public eye: “Now The Subject of a Major Motion Picture.” Thank you, Suffragette (2015). Republished under the title Suffragette: My Own Story, this autobiography chronicles the first steps of the British suffrage movement from approximately 1900 until the beginning of the First World War, when the activists decided to temporarily lay down their arms. Insightful, Moving & Fascinating! A Powerful Read! I Loved It! I actually first started this book in Jan 2016 but didn't have the brain power to commit to it. It's one which I've kept wanting to go back to and finally made the time in January 2018. It felt apt with 2018 being the anniversary of the first bill giving (some) women the vote also with women's rights being openly explored again. This is a really interesting read. There was so much about the suffragette movement which I didn't know or had misunderstood. It explored in detail the necessity of mili I actually first started this book in Jan 2016 but didn't have the brain power to commit to it. It's one which I've kept wanting to go back to and finally made the time in January 2018. It felt apt with 2018 being the anniversary of the first bill giving (some) women the vote also with women's rights being openly explored again. This is a really interesting read. There was so much about the suffragette movement which I didn't know or had misunderstood. It explored in detail the necessity of militant and raises interesting questions about how people will express themselves if they aren't given an opportunity in the society in which they live. The suffering of these women; the cruel attitude of many men in power was a real eye opener for me. I don't tend to read a lot of non-fiction as I prefer the escapism of fiction but this was definitely worth the reality. "Fortunati sono quegli uomini e quelle donne che nascono in un'epoca in cui è in corso una grande battaglia per la libertà umana. Ed è una fortuna in più avere dei genitori che prendono parte ai grandi movimenti del loro tempo in prima persona." Sono queste le parole che aprono l'autobiografia di Emmeline Pankhurst, fondatrice della Women's Social and Political Union (WSPU) e leader del movimento suffragista nel Regno Unito, sono le prime parole di una donna forte e coraggiosa ma soprattutto di u "Fortunati sono quegli uomini e quelle donne che nascono in un'epoca in cui è in corso una grande battaglia per la libertà umana. Ed è una fortuna in più avere dei genitori che prendono parte ai grandi movimenti del loro tempo in prima persona." Sono queste le parole che aprono l'autobiografia di Emmeline Pankhurst, fondatrice della Women's Social and Political Union (WSPU) e leader del movimento suffragista nel Regno Unito, sono le prime parole di una donna forte e coraggiosa ma soprattutto di una personalità in grado di ispirare migliaia di donne attraverso le proprie parole, di guidare un movimento che per anni hanno cercato di nascondere e abbattere, di infondere coraggio e spronare migliaia di vite a non arrendersi davanti a nulla per combattere per i propri diritti e per le future generazioni. Ovviamente non si tratta di una vera e propria autobiografia, solamente nelle prima pagine la Pankhurst accenna brevemente ai genitori, alla sua infanzia, alla sua adolescenza e dopo ancora all'incontro che le cambierà la vita, quello con il marito; ma è degno di nota un episodio che ci racconta e che, a quanto pare, è stato la presa di coscienza che essere donna non era esattamente una condizione favorevole per chi voleva di più dalla vita, la Pankhurst narra di come una sera, i genitori erano soliti a fare un giro di letti per dare la buonanotte ai figli, il padre entrato in camera e convinto che dormisse, pronunciò le parole "Che peccato che non sia un ragazzo": questa frase procurò l'effetto domino, da qui partirono ragionamenti, domande e risposte e si sviluppò l'ideale del diritto al voto per le donne. Dopo queste prime pagine veniamo letteralmente trasportati nel contesto socio-politico dei primi anni del Novecento, in quegli anni che vedono le donne scendere in strada per protestare e per chiedere i propri diritti: i primi anni del movimento costituiscono battaglie all'insegna del pacifismo attraverso dibattiti e riunioni, cercando di avere incontri con il governo e di trovare un'intesa con partiti che appoggiavano l'ideale del movimento, raccogliendo consensi e riunendo più donne possibili per portare all'attenzione, anche del popolo ma soprattutto della stampa, il disagio e la realtà del fatti. Ma quando le suffragette verranno ripagate con la violenza e il carcere allora la situazione si farà sempre più esasperante e pericolosa ed è così che nasceranno soprusi, violenza, atti di criminalità e quant'altro e per quelle donne così combattive rimarrà solo una via d'uscita, una vera e propria rivoluzione. La Pankhurst ci narra episodi veramente tosti da digerire, una crudeltà che io non mi aspettavo, certe torture che le hanno viste vittime sono da condannare e sono, ai giorni nostri, impensabili. Il voto tiepido che ho assegnato è dovuto al fatto che ci sono due distinte parti che compongono questo libro e se l'una l'ho apprezzata l'altra mi ha leggermente annoiata, ma mi spiego meglio. Da una parte assistiamo al racconto "rivoluzionario", come il movimento si comporta davanti agli ostacoli che gli si frappongono, come agisce in vista dei continui rimandi del governo e dei ministri che sembrano essere favorevoli, come combatte in strada e in carcere. Questa è la parte che più ho apprezzato, quella più emotiva e sentita se vogliamo: i racconti dei giorni e delle settimane passate in prigione, la costanza di queste donne che per essere riconosciute come prigioniere di guerra si impongono lo sciopero della fame, il racconto tremendo dell'alimentazione forzata che veniva loro imposta dai medici carcerieri, una tortura sofferta che lacerava lo stomaco e che però non le ha fermate, il racconto della stessa Pankhurst e di come a quello della fame ha seguito lo sciopero della sete e addirittura del sonno e infine di come, dopo pochi giorni, ormai venivano liberate perchè allo stremo delle forze, quasi del tutto morenti. C'è chi ha perduto la vita per non darla vinta al governo, chi è morto per la debilitazione causata dalle ristrettezze del carcere, chi è stato picchiato a morte dalla polizia e chi si è sacrificato volontariamente come Emily Davison che durante una gara si scagliò contro il cavallo di Re Giorgio V con la bandiera suffragista in onore della causa. Dall'altra parte invece c'è tutta la questione politica che ovviamente deve avere il suo spazio ma il modo in cui è stata gestita mi ha un po' infastidita: tra le pagine del racconto infatti ci sono questi lunghi momenti in cui la Pankhurst si perde in leggi, decreti, date e nomi. A parer mio, il suo non è stato il modo migliore per destreggiarsi in anni di legislazioni: capita che in una sola pagina vengano ricordate tre leggi diverse, con nomi affini, che lei utilizza per farci capire il contesto ma che risulta invece abbastanza confusionario. Stesso discorso lo potrei fare per le personalità politiche che vengono chiamate in causa, ad eccezione di pochi che vengono ripetutamente e giustamente tirati in ballo, spesso gli altri che vengono citati solo un paio di volte non si riescono a collocare perfettamente. Quando ci si immerge in questi argomenti ci vorrebbe maggiore chiarezza. L'autobiografia di Emmeline Pankhurst è sicuramente interessante, è uno spaccato di storia che ancora oggi dovrebbe far riflettere molti, è un libro che consiglierei a certi che non capiscono che, in mondo comunque ancora troppo maschilista e sessista, siamo libere di fare certe cose grazie a chi è sceso in campo a combattere per il futuro e che dovremmo noi ora essere grate e degne di avere questi diritti. Interessante sì, ma sono comunque convinta che potesse dare un pochino di più. "Noi siamo qui non perché vogliamo infrangere la legge; siamo qui perché le leggi vogliamo farle." Thrilling events in the history of womens' politics. As an inspirational political speaker, furthering the cause of Womens' Suffrage, Mrs Pankhurst was a phenomenon. As an author though, even in the context of a political memoir, she leaves a lot to be desired. Absolutely amazing story of these brave women fighting for their rights. Let me first explain my reasoning behind the three thumb review; I found this book to be a strangely impersonal account of Mrs. Pankhurst’s life. It read more like a diary of the main events of the WSPU (Suffrage movement) in the lead up to the outbreak of World War I. This made it extremely difficult for me, as a reader, to get a handle on what she was really like as a person, or the opinions of others of the movement of which she and her sister, Christabel, were such a big part of in England; Let me first explain my reasoning behind the three thumb review; I found this book to be a strangely impersonal account of Mrs. Pankhurst’s life. It read more like a diary of the main events of the WSPU (Suffrage movement) in the lead up to the outbreak of World War I. This made it extremely difficult for me, as a reader, to get a handle on what she was really like as a person, or the opinions of others of the movement of which she and her sister, Christabel, were such a big part of in England; this in turn had me doing further research at the library and on the internet to fill in the gaps. Giving an explanation of what propelled her out of the normal role of women in her time, into a political arena is an interesting and eye opening journey into what it was like to be female in the late nineteenth and early twentieth century’s, and this was one of things that kept me reading this book. This book is a snapshot into a turbulent time in British history, and may be an eye opener for those who read it and are not acquainted with the nuances of that time. One thing I became aware of whilst reading this was the tremendous hardships and deprivations these women went through to secure the vote for women. They were humiliated, beaten, force-fed and denigrated in a way that not even the worst of criminals were at the time, all because they wanted more control over their lives and things that ultimately affected the way they lived. This in turn led me to consider the women’s movements today and how they regard the role of women in the twenty first century; there really is no comparison and it made me grateful for the freedoms I do have as a woman today. Emmeline Pankhurst was a British political activist and leader of the British suffragette movement who helped women win the right to vote. In 1999 Time named Pankhurst as one of the 100 Most Important People of the 20th Century, stating: "she shaped an idea of women for our time; she shook society into a new pattern from which there could be no going back." By Topical Press Agency, photographer unk Emmeline Pankhurst was a British political activist and leader of the British suffragette movement who helped women win the right to vote. In 1999 Time named Pankhurst as one of the 100 Most Important People of the 20th Century, stating: "she shaped an idea of women for our time; she shook society into a new pattern from which there could be no going back."